Introduction: Congenital diarrheas correspond to a severe and low frequency digestive disease, with a high mortality. They start a few days or months after birth, leading to intestinal insufficiency and dependence on parenteral nutrition. It must be highly suspected in newborns or infants with diarrhea and severe electrolyte disorders. The diagnosis is based on clinical, endoscopic, histologic and eventually genetic findings. Treatment is supportive with intensive correction of electrolyte imbalances as well as parenteral nutrition. Objective: To present a case report of congenital diarrhea identified as microvillous inclusion disease presenting in the neonatal period. Case report: Male patient currently 3 years of age, son of consanguineous parents. At 10 days of age presents a severe secretory diarrhea, requiring treatment in a critical care unit and parenteral nutrition. Initially he also presented with Fanconi syndrome, which improved afterwards. The suspicion of congenital microvillous inclusion was confirmed later by optic and electronic microscopy, and inmunohistochemistry. A succesful evolution was later achieved maintaining home parenteral nutrition after discharge. Conclusion: We present the first known case in Chile of congenital diarrhea due to microvillous inclusión disease and his evolution. The microvillus inclusion disease belongs to the group of refractory diarrhea in infants that produce intestinal insufficiency during the first days or months of life. It is generated by a severe congenital alteration of the intestinal epithelium resulting in a massive watery diarrhea and a permanent malabsorption that normally lead to a lifelong dependency of total parenteral nutrition (TPN). The microvillus inclusion disease was described for the first time in 1978 by David Andersen et al., who reported a group of 5 infants with severe persistent diarrhea of neonatal stating and common characteristic findings in the intestinal histology1,2. Nowadays its prevalence is estimated in <1:1000.000 and there are few known cases in the world3. The autosomal recessive inheritance is known and it is associated with consanguinity4. There is a slight preponderance of female gender. In general, the pregnancy and childbirth occur with no associated pathology, still oligohydramnios has been described in some cases. There is a neonatal presentation with early onset during the first hours or days of life and a later apparition at 2-3 months3. The clinic is characterized by severe watery diarrhea of secretory type with massive volume losses up to 300 mL/kg/day and big amounts of electrolytes producing quickly the dehydration and serious metabolic imbalance. Moreover, there is an enzymatic deficit in the luminal edge that generates osmotic diarrhea. Within differential diagnosis, other causes of intractable diarrhea in infants should be considered, such as congenital ones caused by transport defects, epithelial dysplasia or tufting enteropathy, autoimmune enteropathy, IPEX syndrome, as well as allergies, infections, and post infectious enteropathy5,6. For the diagnosis, a combination of optical and electronic microscopy of duodenum, jejunum, and colon are used. In the first one, with hematoxylin and eosin stain, it is observed a hypoplastic atrofia that may vary, accumulation of secretory granules with positive periodic acid Schiff (PAS) stain in the apical cytoplasm of enterocytes and no inflammatory infiltrate. The crypts still stay intact. The pathognomonic changes that are intracytoplasmic vacuoles with included microvilli and absence or shortage of microvilli in the luminal edge are recognized using the electronic microscopy. It also can be practice an immunoreactive stain that recognizes a neutral peptidase CD-10, that in this disease, is located within the cytoplasm of enterocytes unlike normal intestine and other intestinal pathologies, which it is normally found on the surface8,9,10. In 2008, a common mutation was identified in most of the patients in the MYO5B gene that codes for the Myosin Vb protein, which it is expressed in all epithelia and is involved in the protein transport towards cell surface and in the cell polarity11,12,13,14. Therefore, it is postulated that the impairment of the protein transport will be the cause of the disease, altering the correct development and the regeneration of the epithelial membrane. The severity of the disease is marked by the careful replacement of electrolyte losses and the TPN treatment. Multiple complications are described,, such as liver damage, nephrocalcinosis, delay in psychomotor development and dead within the first year of life, among others15,16,17. An intestinal transplant is a therapeutic option, alone or in combination with liver, even acceptable survivals can be achieved with TPN at home18,19,20,21,22. In the literature, there is a report of only one patient in which the long-term parenteral nutrition was successfully suspended23. The current survival described in a series of cases is 70%, with more than a half of patients who have received intestinal or liver-intestine combination transplants21. The greatest cause of death is the sepsis. It is presented a case of congenital diarrhea identified as microvillus inclusion disease of neonatal presentation and its evolution. 36-weeks preterm born male infant with 27-years old first-time mom, with gestational diabetes and no others pathologic histories during the pregnancy. Caesarean section because of acute fetal distress. Apgar 9-9. Parents are blood relatives, the mother is an immediate niece of the patient’s father. History of deceased infants in the family (the maternal grandfather’s brothers) with no known diagnosis. He presented a respiratory distress syndrome and a screening was performed with negative infectious results, receiving empirical antibiotic treatment for 7 days. Diarrhea started with liquid stools, mucous, with no blood at 10 days of life, and severe dehydration. He required an invasive ventilatory support, vasoactive drugs for 3 days, and empirical antibiotherapy to suspicious of unproven, necrotizing enterocolitis. The gastric tube feeding and TPN were initiated and it was obtained a laboratory study that showed a severe metabolic acidosis with a normal anion gap, hypokalemia, normal metabolic and negative infectious screening, a normal hormonal and immunity study, normal glycemia, and he was HIV-negative. Positive glucosuria and proteinuria. The patient continued with frequent mucous stools with a volume loss to diarrhea estimated in 190cc/kg/day, refractory at enteral fasting. Reducing substances in stools were positive; electrolytes in stools with Na 120meq/L, CI 67meq/L, stool osmotic gap 30, compatible with secretory diarrhea. Congenital diarrhea with Fanconi syndrome cataloged as transitory was proposed as a diagnosis since subsequently glucosuria and proteinuria decreased. The upper digestive endoscopy was performed at the age of 4 months, finding in the duodenum an aspect compatible with villus atrophy and it was confirmed the final diagnosis of microvillus inclusion disease with optical and electronic microscopy and also immunohistochemistry study (see Figure 1). Since his admission receiving TPN, he has had multiple changes of the central venous catheter (CVC) due to catheter-related infections. The patient evolved with a macroscopic hematuria, evidencing nonobstructive, bilateral renal lithiasis, reason why he received an urinary alkalinizer. At 5 months he presented symptoms of acute abdomen, suspecting a volvulus, however, in the ward was confirmed a diffuse necrosis in a large part of the small intestine due to necrotizing enterocolitis, getting resected 120 cm, remaining 45 cm of jejunal intestine and 25 of distal ileum. At 6 months he presented a massive upper gastrointestinal bleeding, demonstrating a gastric ulcer, probably associated with a prolonged fasting, and a therapeutic endoscopy was carried out. At 10 months the patient was discharged, with Broviac catheter and PTN at home, receiving daily a large amount of additional supplements of electrolytes and bicarbonate (endovenous via: Sodium: 8 meq/kg, Potassium: 4 meq/kg, and Bicarbonate: 7 meq/kg/day. enteral via: Sodium bicarbonate: 6 meq/kg/day), along with iron in an intermittent way, and megadoses of vitamin D. He receives an enteral stimulus through gastrostomy with highly hydrolysate milk and chicken mash, and rice and some vegetables by mouth. Currently, he is 3 years old and is cared for by his parents at home. He has required some rehospitalizations due to sepsis associated with CVC, thrombophlebitis, obstructive bronchitis syndrome, and acute pyelonephritis. He presents compensated chronic malnutrition with low height (T/E: -2.76 z-score; P/E: -1.4 z-score, and P/T: 0.64 z-score) and language delay. He attends kindergarten and performances his daily activities with a backpack adapted to parental feeding. To date, no hepatopathy. Genetic counseling was provided to the parents. Figure 1a. Light microscopy, with Hematoxilina and Eosin stain, magnification 10x. 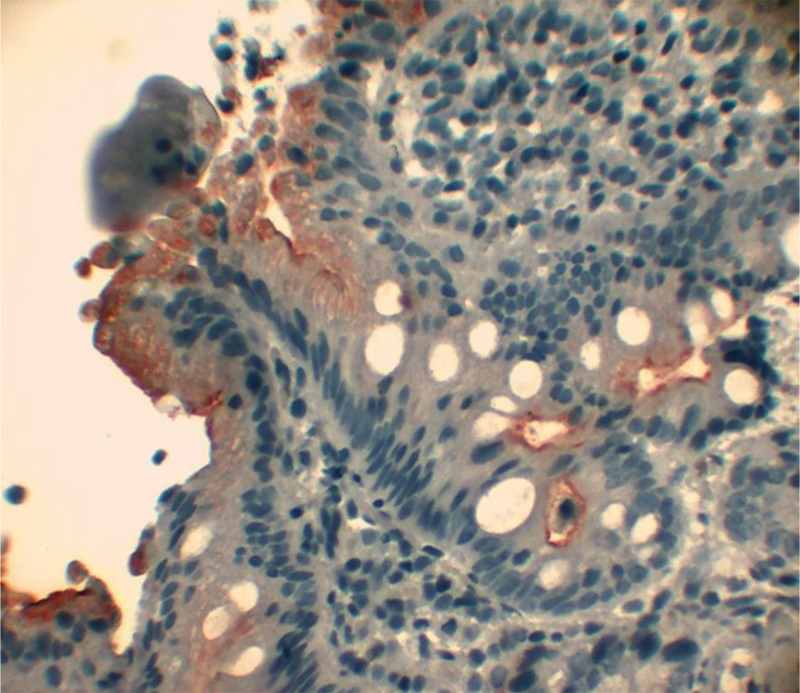 Duodenal mucosa with subtotal villous atrophy, without inflammation. Figure 1b. Light microscopy, with Hematoxilina and Eosin stain, magnification 40x. Duodenal mucosa with subtotal villous atrophy, without inflammation. Figure 2. CD 10 Immunostaining. Intense marking CD10+ of the luminal line inside of the enterocytes, characteristic of the microvillus inclusion disease. Figure 3a. 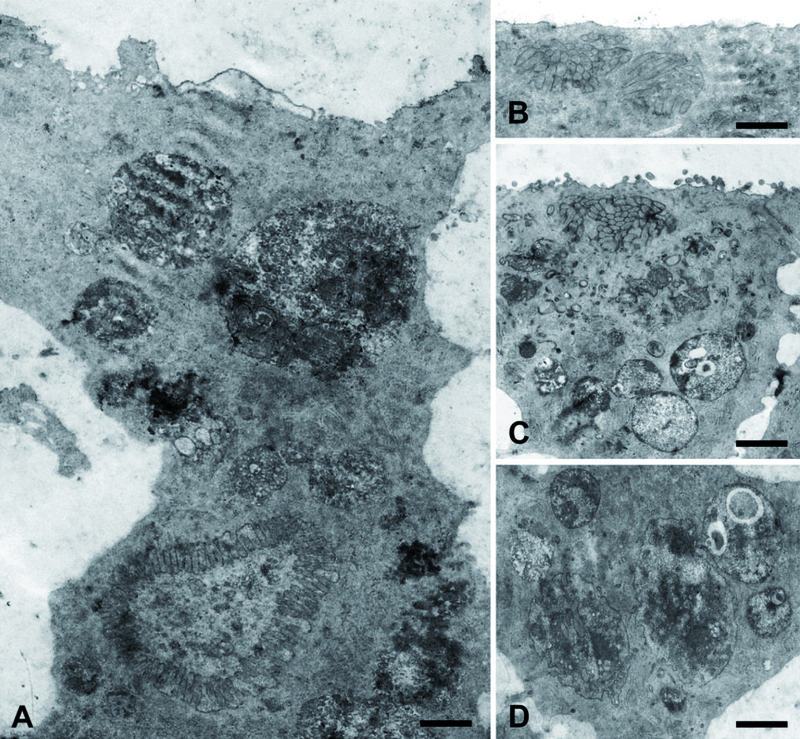 Electron microscopy (markers=1um): A. Intestinal epithelial cell and his apical border without MV; inclusions and vacuoles with autophagy vesicles inside. B. Apical border with inclusiones. 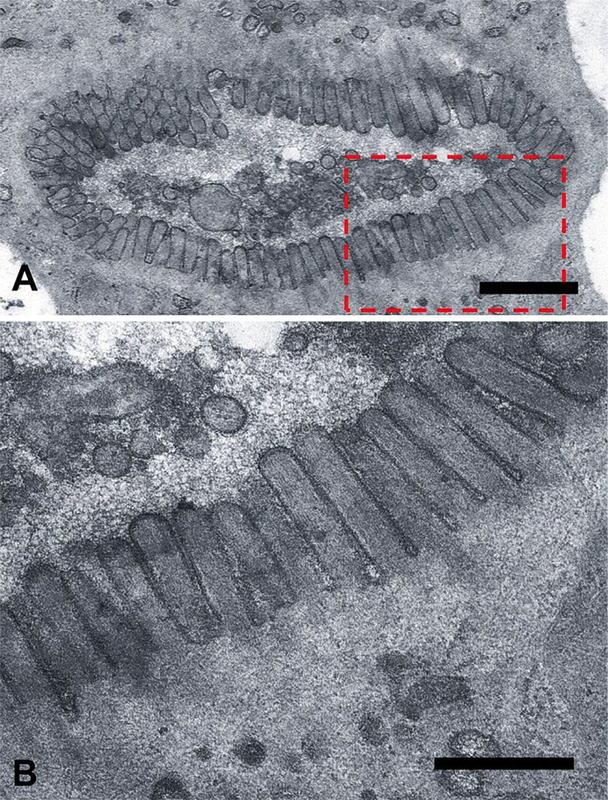 C. Few microvilli on the apical border, inclusiones and digestive vacuoles. D. Digestive vacuoles (autophagic). Figure 3b. Electron microscopy (Markers in A = 1 um; B = 0.5 um). A. Citoplasmic vacuole with microvilli. B. Magnification of picture A. Microvilli cover the luminal surface of the vacuole. Figure 4. 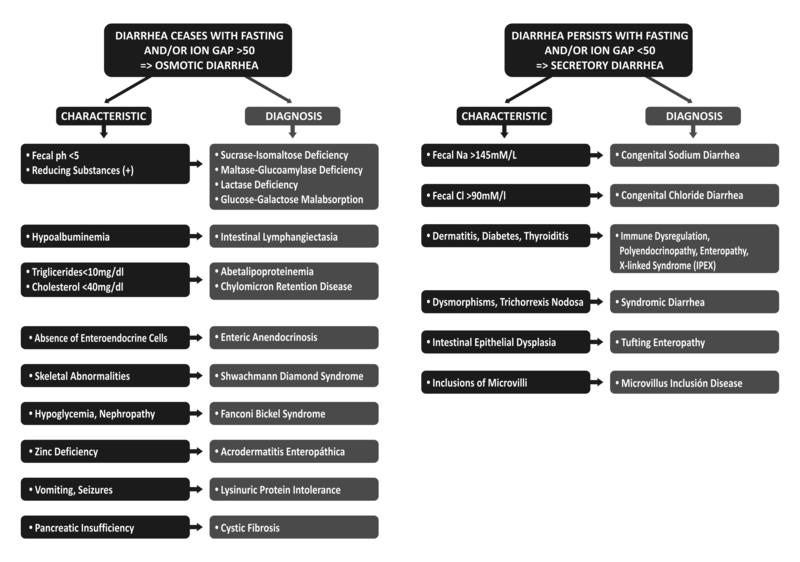 Algorithm for the differential diagnosis of congenital diarrhea using the stool osmotic gap. The congenital diarrhea of neonatal presentation means a rare and severe pathology that initially requires a careful stabilization with electrolyte replacement and then an exhaustive etiological research. In the presented case, it was discarded at first infectious, hormonal, immunological, and metabolic causes. Posteriorly, it was suspected microvillus inclusion disease due to the characteristic of secretory diarrhea, provided by the differential diagnosis with osmotic diarrhea (for example, due to an enzyme deficiency; see algorithm) and because of the quantified losses of electrolyte in stools, which were incompatible with other entities as congenital sodium or chloride diarrhea. The final diagnosis was achieved through optical and electronic microscopy, along with immunohistochemistry, with previously described characteristics in the reported cases in the world literature. The genetic analysis could also have helped, but it is not available in Chile yet. The Fanconi syndrome, mentioned in the world literature in two similar cases 15, was transitory and it was attributed to tubulopathy due to severe dehydration. The nephrocalcinosis is a known complication related to intestinal malabsorption 16. 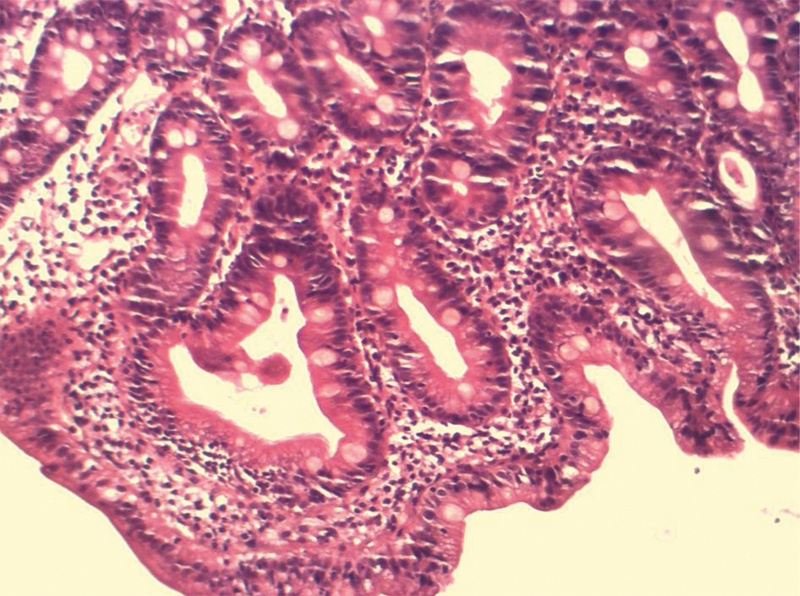 The necrotizing enterocolitis is also an associated entity published in a previous case, but the patient, in that case, had other risk factors as great prematurity and a fatal outcome. In our case, a short intestine was generated, it did not mean a major change in the patient management, mainly based on TPN. It is presented the first case, to the best of our knowledge, of a patient with microvillus inclusion disease diagnosticated and managed in Chile and its evolution. Thanks to the implementation of TPN at home, it is provided an acceptable life quality for the patient and his family in the context of a severe congenital diarrhea with high mortality. 1. Davidson GP, Cutz E, Hamilton JR, Gall DG. Familial enteropathy: a síndrome of protracted diarrhea from birth, failure to thrive and hipoplastic villous atrophy. Gastroenterology. 1978;75:783-90. 2. Phillips AD, Jenkins P, Raafat F, Walker-Smith JA. Congenital microvillous atrophy: specific diagnostic features. Archives of Disease in Childhood. 1985;60:135-40. 3. Goulet OJ, Brousse N, Canioni D, Walker-Smith JA, Schmitz J, Phillips AD. Syndrome of intractable diarrhea with persistent villous atrophy in early childhood: A clinicopathological survey of 47 cases. J Pediatr Gastroenterol Nutr. 1998;26(2):151-61. 4. Nathavitharana KA, Green NJ, Raafat F, Booth IW. Siblings with microvillous inclusión disease. Archives of Disease in Childhood. 1994;71:71-3. 5. Volonaki E, Sebire N, Borrelli O, et al. 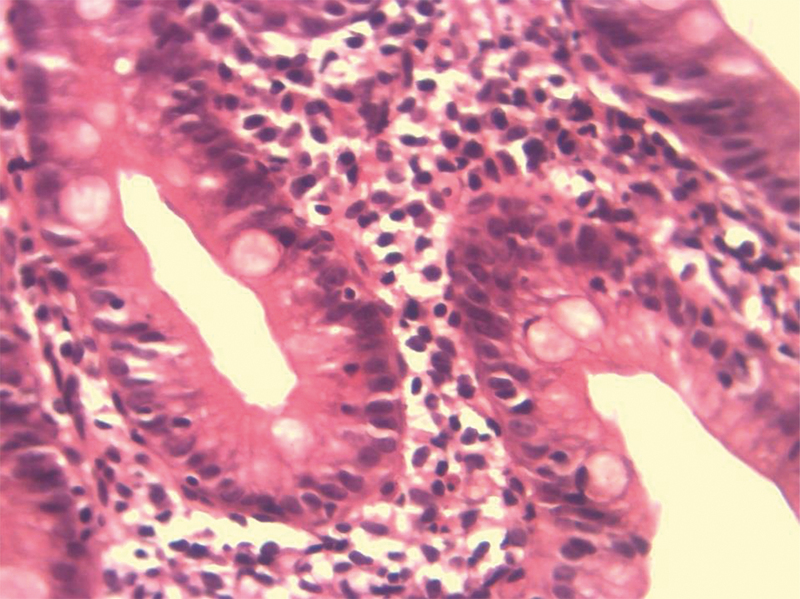 Gastrointestinal Endoscopy and Mucosal Biopsy in the First Year of Life: Indications and Outcome. J Pediatr Gastroenterol Nutr. 2012;55:62-5. 6. Terrin G, Tomaiuolo R, Passariello A, et al. Congenital Diarrheal Disorders: An Updated Diagnostic Approach. Int J Mol Sci. 2012;13:4168-85. 7. Phillips AD, Szafransky M, Man LY, Wall W. Periodic Acid Schiff Staining Abnormality in Microvillous Atrophy: Photometric and Ultrastructural Studies. J Pediatr Gastroenterol Nutr. 2000;30(1):34-42. 8. Reinshagen K, Naim HY, Zimmer K-P. Autophagocytosis of the apical membrane in microvillus disease. Gut. 2002;51:514-21. 9. Bell S, Kerner J, Sibley R. Microvillous Inclusión Disease The Importance of Electron Microscopy for Diagnosis. Am J Surg Path. 1991;15(12):1157-64. 10. Khubchandani SR, Vohra P, Chitale AR, Sidana P. Microvillus inclusión disease-An Ultrastructural Diagnosis: with a Review of the literatura. Ultrastruct Pathol. 2011;35(2):87-91. 11. Golachowska MR, Hoekstra D, van Ijzendoorn S. Recycling endosomes in apical plasma membrane domain formation and epitelial cell polarity. Trends Cell Biol 2010;20(10): 618-26. 12. Canani R, Terrin G, Cardillo G, Tomaiuolo R, Castaldo G. Congenital Diarrheal Disorders: Improved Understanding of Gene Defects is leading to Advances in Intestinal Physiology and Clinical Management. J Pediatr Gastroenterol Nutr. 2010;50:360-6. 13. Mueller T, Hess M, Schiefermeier N, et al. MYO5B Mutation cause microvillus inclusión disease and disrupt epitelial cell polarity. Nat Genet. 2008; 40 (10): 1163-5. 14. Szperl A, Golachowska M, Bruinenberg M, et al. Functional Characterization of Mutations in the Myosin Vb Gene associated with Microvillus inclusion disease. J Pediatr Gastroenterol Nutr. 2011;52:307-13. 15. Golachowska M, van Dael C, Keuning H, et al. MYO5B Mutations in patients with Microvillus Inclusions Disease presenting with Transient Renal Fanconi Syndrome. J Pediatr Gastroenterol Nutr. 2012;54:491-8. 16. Siahanidou T, Koutsounaki E, Skiathitou A-V, et al. Extraintestinal manifestations in an infant with microvillus inclusion disease: complications or features of the disease? Eur J Pediatr. 2013;172:1271-5. 17. Girard M, Lacaille F, Verkarre V, et al. MYO5B and Bile Salt Export Pump Contribute to Cholestatic Liver Disorders in Microvillous Inclusion Disease. Hepatology. 2014;60(1):301-10. 18. Halac U, Lacaille F, Joly F, et al. Microvillous inclusión disease: How to improve the prognosis of a severe congenital enterocyte disorder. J Pediatr Gastroenterol Nutr. 2011;52:460-5. 19. Goulet O. Enteropatía congénita y trasplante intestinal. Ann Nestlé (Esp). 2006;64:25-37. 20. Colomb V, Dabbas-Tyan M, et al. Long-term outcome of children receiving Home Parenteral Nutrition: a 20-year Single-Center Experience in 302 Patients. J Pediatr Gastroenterol Nutr. 2007;44:347-53. 21. D’Antiga L, Goulet O. Intestinal Failure in Children: The European view. J Pediatr Gastroenterol Nutr. 2013;56:118-26. 22. Pironi L, Goulet O, Buchman A, et al. Outcome on Home Parenteral Nutrition for benign intestinal failure: a review of the literature and benchmarking with the European prospective survey of ESPEN. Clinical Nutrition. 2012;31:831-45. 23. Croft N, Howatson A, Ling S, Nairn L, Evans TJ, Weaver LT. Case report Microvillous inclusión disease: An evolving condition. J Pediatr Gastroenterol Nutr. 2000;31:185-9. 24. Sayar E, Kalay S, Yilmaz A, et al. Microvillus Inclusion Disease associated with enterocolitis. AJP Rep. 2014;4(2):e61-4.